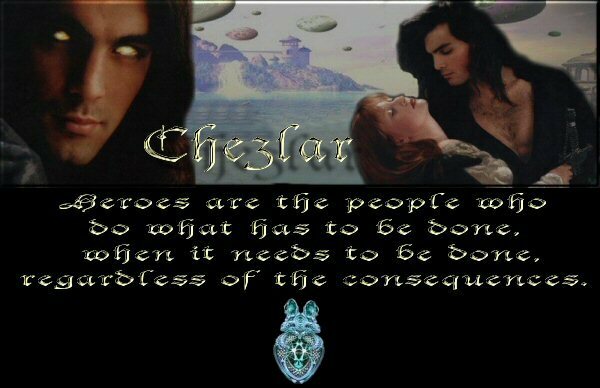 Chezlar believed in re-incarnation, of course he did. He was the instrument of the Fates. He had taken more souls to Haldanuru for 'recycling' than he could shake a stick at. He had seen the people in this room reborn more times than he could count. He had sealed D'Riels into their crystal tombs to sleep until they rose again when death came too soon. It was a blessing and a curse. The joy in knowing they never really came to and end, and having to say goodbye so many times. Marion had been reborn.. somewhere, but even if he had tried to find her things would not have been the same. She was someone else with a different path, different dreams... a whole new love. And his children. Well. Some things did well and truly die. When the fates wiped something from existence they were well and truly gone. He managed a smile for her though, and lifted her hands to kiss the back of them. "Perhaps," he agreed. After all.. what was hope without a dream? He glanced over at An'Thaya were she was tangled up with Galain and saw something else overshadowing them for a moment. Not completely lost, he supposed, but something entirely different. "Jerri outdid herself this year," he commented, watching the train of young Alcarins trotting too and fro from the kitchen.